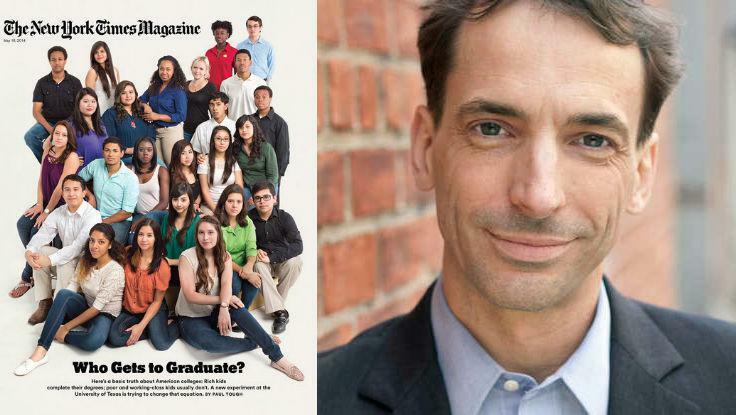 In this week's New York Times Magazine cover story, education speaker Paul Tough takes a look at the graduation gap between advantaged and disadvantaged students at American universities. Who Gets to Graduate? focuses on an experiment at the University of Texas at Austin that is trying to find an answer to the question: "How, precisely, do you motivate students to take the steps they need to take in order to succeed?" When we asked Tough why he was compelled to write about higher education, he told us: "Ever since How Children Succeed came out, I’ve been interested in writing about the growing disparities in higher education, and especially the gaps in graduation rates between well-off students and working-class students. I was intrigued by this new body of research that suggests that the psychology of college students—whether they feel they belong on campus and deserve to be in college—might be a big part of the problem, and potentially a big part of the solution. And when I heard about the experiments going on at the University of Texas in Austin, it felt like a great setting for a deep look at the issue. I was fascinated by what I learned at U.T., and my hope is that these new approaches can help colleges start to bridge some of the higher-education divide." Tough, who is the author of How Children Succeed: Grit, Curiosity, and the Hidden Power of Character, begins his New York Times Magazine piece with the hard facts: "More than 40 percent of American students who start at four-year colleges haven’t earned a degree after six years. [And] whether a student graduates or not seems to depend today almost entirely on just one factor—how much money his or her parents make. To put it in blunt terms: Rich kids graduate; poor and working-class kids don’t." He dives into the research that U.T. is conducting and the ways the university is trying to deal with not only academic and financial obstacles, but also students' doubts, misconceptions, and fears. The mentorship, tutoring, and leadership programs—as well as what they call "mind-set interventions"—U.T. is now offering are working to deal with those issues. And, so far, they are making a difference. "The central mission [of] American universities [is arguably] to take large numbers of highly motivated working-class teenagers and give them the tools they need to become successful professionals," says Tough. "The U.T. experiment reminds us that that process isn’t easy; it never has been. But it also reminds us that it is possible." In his talks, Tough addresses the issues facing students—from kindergarten to post-secondary—and provides solutions for a more successful, and fulfilling, path through the education system and into the adult world. To book Paul Tough for your next event, contact The Lavin Agency.